Buy one or create a cage bank to meet your needs. Purchase multiple cage units for a custom configuration that fits your business. 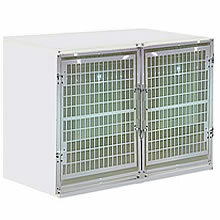 Virtually indestructible cages. Durability and pleasantly priced. Designed with your needs in mind. Our modular cages are designed from the ground up, color-coordinated and ergonomically built to make the best impression on your customers, and provide the most efficient working environment for you. The front doors are shorter to allow room to pull out the trays without opening the door. Includes: 2 doors that latch in the front middle. Pleasant to the eye and designed to make the best impression on your customers. - Floor Grill Dimensions: 42" X 25-1/4"
- Waste Tray Measurements Each: 19-1/2" x 25-1/2"
Note: The Waste Trays that accommodate the F630 are a set of two. This is due to the divider in the center. 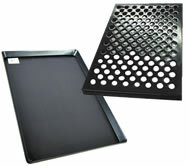 Floor Grill Demensions: 42" X 25-1/4"
Waste Tray Measurements Each: 19-1/2" x 25-1/2"